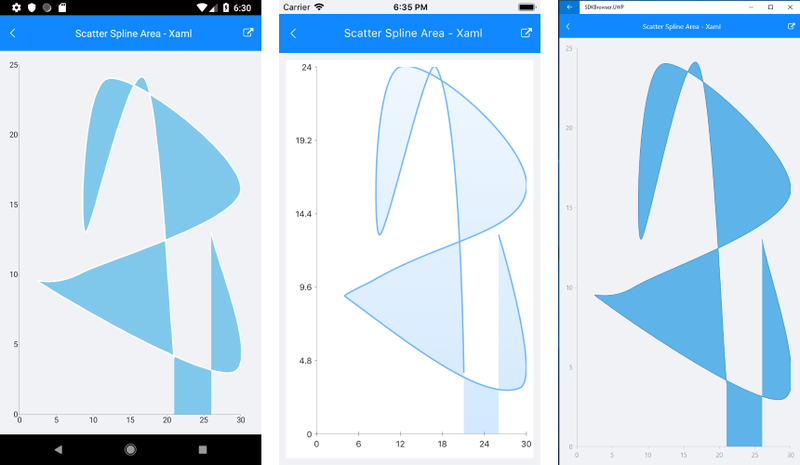 RadCartesianChart visualizes ScatterSplineAreaSeries as the area enclosed by the coordinate axes and curved line segments that connect the series data points. The ScatterSplineAreaSeries inherit from the ScatterPointSeries class and also require both axes of the chart to be of type NumericalAxis. XValueBinding : Defines the binding that will be used to fill the XValue of ScatterDataPoint members of the DataPoints collection. YValueBinding : Defines the binding that will be used to fill the YValue of ScatterDataPoint members of the DataPoints collection. Fill (Color): Changes the color used to fill the area shapes. A sample ScatterSplineArea Series example can be found in the Chart/Series folder of the SDK Samples Browser application.